The wife of Keith Scott recorded the moments leading up to the shooting by the police in Charlotte, North Carolina. A video of the incident was released to several media outlets on Friday, including his wife’s pleas to her husband not to exit a truck and telling the police not to shoot him. The video doesn’t actually show the shooting take place. 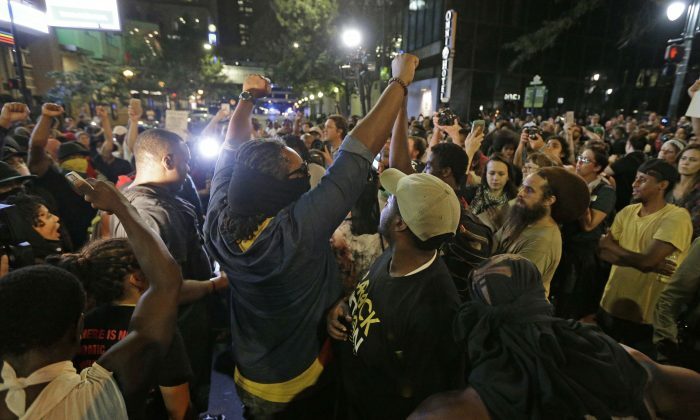 Scott’s death triggered protests and riots across Charlotte. Police said that he had a gun, while his family claimed he had a book when he was shot. “Don’t shoot him. He has no weapon … he ain’t do anything,” his wife can be heard in the video. “He’s not going to do anything to you guys … he just took his medicine,” she said. After the shots are heard, Scott can be seen lying face-down on the ground while his wife repeatedly says “he better live.” She continues recording and asks if an ambulance has been called. The officers stand over Scott. It is not clear if they are checking him for weapons or attempting to give first aid. “He doesn’t have a gun. He has a TBI [a Traumatic Brain Injury]. He’s not going to do anything to you guys. He just took his medicine. “Keith, don’t let them break the windows — come on out the car. “Keith, Keith, don’t you do it. Keith! Keith! Don’t you do it! A burst of gunfire is then heard, with at least three shots fired. Later, as she walks up to the scene, three officers could be seen around Scott—two standing near him and another kneeling over him. The video can be viewed here (warning: contains content that some might find disturbing or offensive).